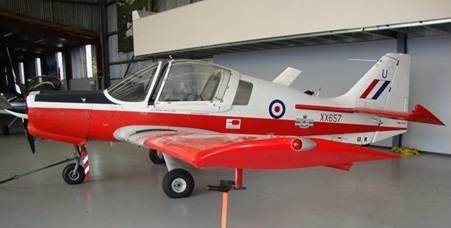 A military version of the Pup was developed after being assessed by Rolls Royce Test Pilot Graham Andrews, who made 12 recommendations including its adaptation to a twin seated aircraft suitable for training purposes. The aircraft evolved into the Beagle B.125 Bulldog with a 200 hp (150 kW) Lycoming engine. Only one prototype aircraft was built by Beagle (with another largely complete) before it ceased operations; the design and production was taken over by Scottish Aviation. The Bulldog development of the B121 Pup was designed by Beagle as the B125, the prototype G-AXEH (c/n 001) flying from Shorehamon May 19,1969. Following Beagle's collapse Scottish Aviation took over design and production rights in May 1970 and moved manufacturing facilities to Prestwick. SAL flew the second prototype G-AXIG (c/n 002) on February 14, 1971, in the colours of the Swedish Air Force. The third airframe (c/n 003) was used for ground structural testing. Designated the Bulldog Series 100, the first production aircraft G-AYWN (c/n BH100-101) was flown on June 22 as the first Bulldog for Sweden, serialled 61001, and operated in Sweden as the Sk61. It was followed by the second for Sweden, G-AYWO/61002 (c/n BH100-102), on July 14, both being delivered on July 26. Further allocations are G-AYWP, 'YZL, 'YZM and G-AZAK to ZAT, respectively BH100-103 to 114 and serialled 61003 to 61015. These are all known as Model 101. Following on the production line are the first Model 102s for the Malaysian Air Force, BH100-115 and 116. In 1971 orders were for 58 Bulldogs for Sweden, 15 for Malaysia and five for Kenya. In 1973, Finnaviation received a research and development contract from the Swedish Air Force to design skis for their primary trainer, Beagle Bulldog. The Swedes had developed a unique bottom shape for the skis around which an aerodynamic casing and load carrying structure of fiberglass epoxy laminate was designed. The skis were test loaded in the Helsinki University of Techonology structures lab. Beagle, tried to get its two-airplane line accepted in the U.S. The Pup, was expensive, slow for such a clean-appearing airframe, and was against the most difficult market for an import-the low-cost basic trainers. Beagle Aircraft Limited went into receivership and production ceased in 1982. In 2014, Ex-Nigerian Air Force Bulldogs were sold as scrap and shipped to Palmerston North, New Zealand, for rebuild or resale. Engine: Lycoming IO-360-A1B6, 200 hp. Wing span: 33 ft (10m). Rear seat cap: 200 lb. Max speed: 150 mph (241 km/h). Wing span: 31 ft 0 in (9.45 m). Length: 22 ft 9 in (6.93 m). Height: 8 ft 6 in (2.59 m). Max TO wt: 1600 lb (725 kg). Max level speed: 153 mph (246 kph).